With a Bit of Smoke, a Few Mirrors and a Degree in Hieroglyphics, Anyone Can Learn to Read a P&ID. This is Part 1 of a five-part series. Engineers love to draw. Not necessarily in an artistic sense of the word, although beauty is, as they say, in the eye of the beholder. As for me, well, I've never been accused of having a particular gift in the arts, or photography for that matter (see bio mug shot taken in my natural habitat), but I have done a few process drawings in my 25? years as a process engineer. I guess that's earned me my vice, VP of Engineering and Technology Development to be precise. Hi there. I'm Bob Cook and I'm glad to have you along for my premier entry here on ChEnected.com where we explore the interpretation of Piping and Instrumentation Diagrams, or P&IDs for those in the know. This is a topic that can benefit process, project and design engineers, business developers, operators, safety, maintenance and even management. Wow, that a lot of folks! However, consider this - all of the members listed above will either come across P&IDs intermittently or have to work with them as a core aspect of their job. And if I still have your attention then, yes, you too should have a solid understanding of how to read them! Hey you hiding the back...don't be bashful. You say that you are two, three...five years out of school and still not sure you really have a good handle on P&IDs? You're not alone. Having worked for many companies and provided services to a variety of industries over the years, I find it curious how P&IDs are often poorly understood by those who should know them better. In some cases, they exude this aura of intimidating, complex documents that only ChE geeks (and the like) really know how to read. I believe this is simply due to a dearth of formal training. Folks are just expected to pick it up "on the fly". Given the variability in career direction our backgrounds in the best engineering field afford us, this works well for some but leaves others playing catch-up later on. So even experienced engineers and operators may one day discover their lack of knowledge on the topic puts them at a disadvantage. So let's just put a stop to all that by taking P&IDs apart in this multi-part series. Regardless of experience level, you will find many of the symbols are obvious. Others need a bit more explanation. 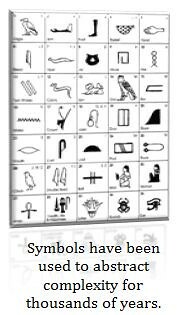 In much the same way ancient Egyptians used hieroglyphics thousands of years ago, we process folks (in conjunction with our peers in the electrical, controls and other departments) just come up with our own set of symbols to represent the various equipment, devices and control concepts that go into our plants. When you look at it that way, one could argue that not much has changed in a few thousand years. I suppose that's true. Hey, if it isn't broke, why fix it? Enough of my bantering, let's get started already. I look forward to a healthy exchange. Part 2 will dig into P&IDs - The Fundamentals. I'll include a few example drawings that we can use as we venture forth down that path of process knowledge. If you want to get a head start, download them here. Stay tuned! Comments or Questions? Just make/ask them in the comments field. Answers will probably come in a future post in the series but I'd love to see your questions or observations. Abbas - the comment system is giving me fits. For now, I will simply say that this is a topic of Part 2 in the series (although I drafted up a thorough response to your question). I just can&#039;t get it to post, maybe owing to text limitations. Thanks for the feedback. My foray into the so-called blogosphere. I need to look that up and see if that term actually made the leap in Webster&#039;s. I&#039;m having fun with it. I agree, I look forward to the remainder of the series as well. This is quite enlightening.I am eager to see the remaining series. Keep up the good work. Ref P&amp;ID no. D100 . the HS symbol next to pump (1101) motor has DSC over it . What does this mean? As a PE who is rusty on P&amp;ID symbology -- Congratulations on writing these user friendly articles. They will help me . Greg, Peferred? I suppose that depends on who you ask because their is no standard that I am aware of. I suggest that when the P&amp;IDs are developed in CAD, any SIS-related systems/symbology be developed on a separate layer so that it can be easily compared and viewed alongside the process controls. Attempting to illustrate process and SIS control systems might get complicated fast since the clarity of the P&amp;ID will be sacrificed. I&#039;d be interested in seeing some of the examples and maybe hearing from the larger group on this topic. COULD YOU PLEASE SHARE THE DWG FILES INSTEAD OF THE PDF. MY e-mail is khleifat_61@yahoo.com, please send me all parts with PDF and the drawings. Please post a link to the DWG . It would be very useful to all to just download the DWG files and use the symbols and blocks. These are an excellent example, is it possible also to have the documents in dwg format ? Profile : Instrumentation & Control Engineer Experience : 7 Years Having good knowledge of P&ID , Process Loop Diagrams , Data Sheet , Control Wiring Diagarms ,control valves , pneumatic on off valves , solenoid valves , PID controller , FlowMeters , flow switch , pressure transmitter,Level Transmitter RTD, Thermocouple ,PLC, HMI & DCS Systems , MCC & Control Panels. VFD , Soft starters. Completed various chemical , oil , gas & food industry projects. Having passport , willing to work any where. SKYPE ID: yogender472. Waiting for your Kind reply. Hi, can you please email me the PDF for example P&IDS/ lead sheets? brett.campbell@stagelectrical.com.au Thanks.